From deluxe places of staying, abounding water activities, local restaurants, to peculiar sightseeings, West Bali has it all. 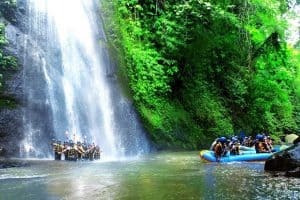 Going to Bali in the western part offers these amazing places you don’t have to share it with throngs of other tourists. Here are some must-see places in West Bali. This quiet place in a peninsula is one of the pioneers of a new kind of travel called glamping (glamorous camping) in Bali. It offers outdoor enthusiasts that intimate experience with nature without sacrificing luxury and comfort. Glamping takes camping to a whole new level where overall inclusive-inclusive! Beach glamping not only for people backpacking in Indonesia, but that’s also why at Menjangan Dynasty Resort you can find 24 beach glamping with large decks and loungers included. Supported by breathtaking surroundings, safari ambiance, and high-standard comfort, there is no reason not to come here. This West Bali best kept natural things generally known only among locals. The Musi Village or Desa Musi is a refreshing escape for those seeking an authentic experience in a simple Balinese among the many popular villages in Indonesia. There, you’ll discover a cliff area where a waterfall crashes powerfully into a natural pool. In addition, the village has an amazing sunset view. You can take a stroll in the village, hunt for the scattered Hindu temples and observe the simple daily life of the villagers. The west part Bali has many natural resources untouched for tourists. One of them is Green Cliff in the Yehembang Kangin Village. 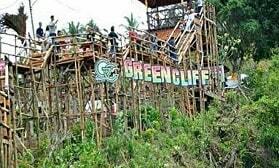 It is a natural cliff overlooking greenery and scenic cliffs. At the top of the cliff, you will be rewarded with a panorama of the Yeh cliff and the sounds of the river at the bottom. The locals built the simple bamboo construction at the edge of the cliff to conserve the natural environment. This place took a path to the wonders of nature. It promises an intimate encounter with the sea of a green panorama. There are many unique things in Bali to experience in the island of the Gods. It doesn’t have to be white sandy Bali beaches or spiritual secluded temples. It just needs a random sighting in a peculiar place. Such as an abandoned plane, in the middle of nowhere. Although it’s not a new phenomenon, these abandoned aircraft serves great for taking photos. The aircraft has become an attraction for travelers and locals. Paroki Hati Kudus Yesus The Hindu religion is highly influential all around Bali. It manages to blend well with the various Hindu temples, festivals, and ceremonies. It also blends well with other religious landmarks on the island. Palasari Church has an industry atmosphere reflecting the two religions live together peacefully, merged in this beautiful Bali architectural masterpieces. Today, it holds the name of Paroki Hati Kudus Yesus (which means The Jesus Sacred Heart Congregation) with many congregants in Bali with the largest number of Catholics compared to other churches in Bali. In the midst of wild nature, there is a large resort hidden in the middle of the jungle of West Bali National Park. 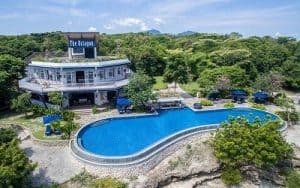 It takes advantage of the beach side of the park, the Plataran Menjangan Resort and Spa, an immense Mediterranean-style resort boasts of an iconic three-story-high Octagon Ocean Club, as far as the eyes can see. As the name suggests, the club has an octagon feature to capture 360-degree views of the national park and the ocean. Here, you’ll get a mix of unique dining experience of fresh seafood, Asian and international cuisine with interesting cultural performances. Moreover, this place allows the customer to encounter with the wild nature of West Bali. Bali serves infinite beach choices with an unique local type of venture into the wild. 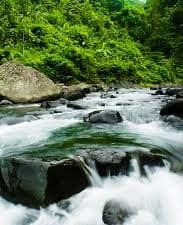 You can head to the natural river and be spoiled by the fresh and clear river springs in Gelar river. Going to Bali means it is very easy to find a clean natural river. This amazing place is located near the Green Cliff in Jembrana district, and mostly only familiar among locals. This River is increasingly popular for its crystal translucent clear water, in which residents nearby sometimes bathe in. You can bring along your snorkeling goggles, swimming rings, paddles, or even just a swimming suit, and splash into the water for some fun. The river has become the icon of the area for local and offers visitors an authentic Balinese entertainment and Instagrammable places. Getting to this small rocky famous waterfall is indeed an adventurous journey. You will have to walk across the paved stone’s path, off the beaten path indeed. After a long tiring walk, you will be awarded the view of beautiful natural surroundings which will make your difficult journey worthwhile. Dewasana area highlights a hidden waterfall among the locals as the Dewasana Waterfall. The uniqueness about the place is the “Batu belah”, which means rocks that are cut into two in Bahasa. Here, the water flows into a lovely pool perfect for a bath and cooling yourself in the water which is refreshingly chill due to the surrounding rocks. There are numerous interesting water activities that you can do in West Bali. You can try your hands on diving, swimming, banana boating, sailing, sunbathing and many more. Pasir Putih Dive & Watersport Centre, operated by Bali Hai Diving Adventures, offers scuba diving course and other water activities. 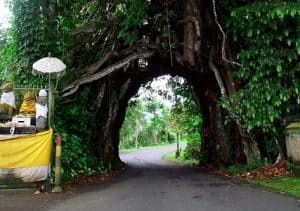 In the Manggissari village, the most western part of Bali stands yet another majestic tree for a spiritual experience in the island. This tree doesn’t have a history for granting wishes and Bunut Bolong Tree (meaning “tree with a hole in it”) has a far more ominous history. The tree has roots on both sides of a stretch of road, forming an archway that visitors can drive through. This place has more a photographable ambiance. There is another road next to it for the non-believers of this mystical. But regardless of your belief in the legend, there’s nothing like a bit of risk to tackle the adventurer’s interest. Bali has a romance vibe perfect for couples. many come to the island to have their wedding, honeymoon and even anniversaries. There are many romantic places that offer great lovey-dovey atmosphere. This restaurant is one of them. Bali Tower Restaurant has an open-air platform on a tower that soars over the forest cover with an amazing view. You are surrounded by leaves and bathed in sunlight, mountains, valleys, and beaches from on high, it will definitely become a memory to remember. There you have it, those are the tourist attractions you must see in West Bali. They offer great experience and definitely create a non typical kind of holiday.